Large 8 feet high by 40 feet wide hand-painted murals with Academic Themes to create a dining room that actually is a sparkling diamond! Branding the dining room with the “Pick & Shovel Café” name. 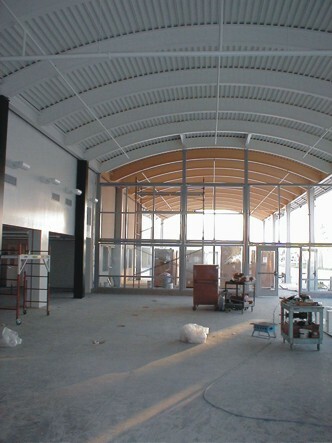 Before: This is new construction at a new high-tech high school. Lots of windows with marvelous lighting and a large open room. 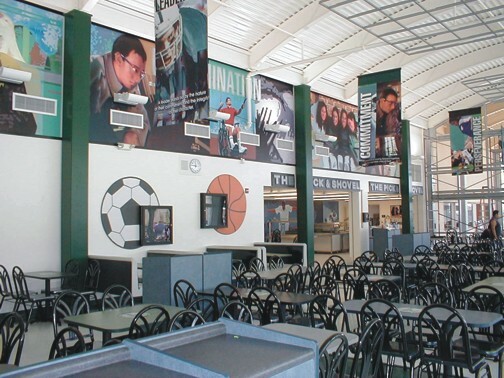 After: The “Pick and Shovel Café” is created with large academic themed murals, big banners hanging from the ceiling and special metal frame décor ceiling pieces (Isn’t this an inviting dining room? ).